ClickFunnels is an online platform that allows you to create more than just sales pages and landing pages, it lets you build end to end sales funnels. ClickFunnels is one of the most popular online marketing solutions and is used by entrepreneurs in various niches. What I don't like about ClickFunnels? There are a number of ClickFunnels reviews across the internet and most of them will either tell you that ClickFunnels is a revolutionary piece of software that will make you rich or it's complete crap and you shouldn't use it. Now neither of this is accurate and that's the reason I decided to create this ClickFunnels review guide and explore every aspect of using the tool. 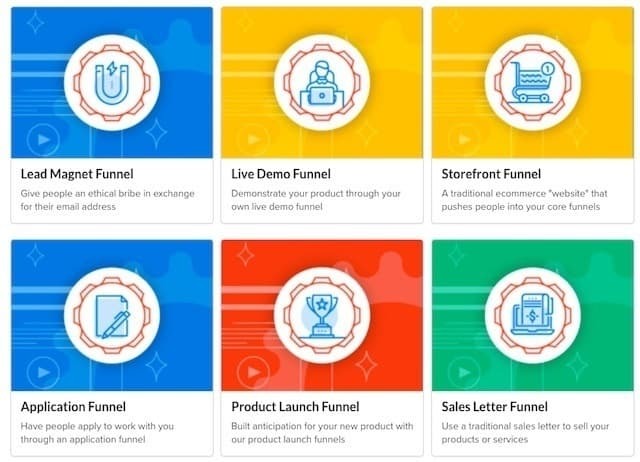 ClickFunnels is currently the most popular sales funnel builder in the market and is used by 50,000+ users to build all sorts of funnels - lead capture funnels, webinar funnels, product launch funnels etc. Is ClickFunnels right for you? This is an important decision because building a sales funnel requires significant investment of time and money and I want you to be sure that ClickFunnels is the right program for your needs before subscribing to it. how to build sales funnels using ClickFunnels. ClickFunnels Pricing Review: Is It Worth the Investment? Before we start discussing ClickFunnels, its important to understand the concept of sales funnels. A sales funnel is a series of steps to turn your visitors into paying customers. At the top of the funnel, you have potential customers – people who could be interested in your product or service, but to whom you've never spoken. You take your potential customers through a series of steps (basically the funnel) to engage them and build trust and ultimately turn them into paying customers. Watch this short introduction video that will give you a better idea about Sales Funnels and also introduce you to ClickFunnels. If you build a sales funnel the traditional way, you would need at least a landing page builder, a checkout system for accepting payments, an email marketing solution for follow up emails and a system to deliver your content. Now ClickFunnels aims to be that all-in-one solution that can perform all these functions and allow you to build a complete sales funnel without requiring to use third party solutions (and its still far from reaching that stage). It actually includes three different solutions - ClickFunnels (Sales Funnel Builder), Actionetics (Marketing Automation Platform) and BackPack (Affiliate Management System). ClickFunnels was cofounded by Russell Brunson who has authored popular marketing books like Expert Secrets and DotCom Secrets and has helped thousands of entrepreneurs build their businesses online. ClickFunnels makes it really easy to build complex sales funnels. You can choose from 26 pre-built funnel types. The funnel types range from a simple lead capture funnel to a more complex 2-step Tripwire Funnel or a Product Launch Funnel. Once you select a funnel type, you'll see all the templates for that particular type. You can either choose one of the free templates or buy a paid one as well and then you'll be able to add it to your account. Once you add the funnel, you'll be taken to the funnel manager where you will see all the steps in your funnel in the left panel. To edit a particular page, click on that page in the left panel and then click on the 'Edit Page' button. This will launch ClickFunnels page editor where you can customize your landing page. The page builder is intuitive and easy to use. You can add a row or a column or even a custom element to your page by dragging and dropping and then you can select the element to change its style etc. Similarly, you can customize other pages in your funnel. You obviously have to integrate your funnel steps with your email service provider and your payment gateway. One handy thing about the Funnel Manager is the launch checklist where you can see the steps you need to take before you can make your funnel live. And once you make your funnel live and start driving traffic to it, you can see all the stats in your funnel manager. I hope this quick demo & tutorial helped you get an overview of the process of building funnels using ClickFunnels. Enter your best email to get instant access to the 5 high converting funnels used by 6-figure course creators. Before we take our discussion to PROs and CONs, let's discuss the ClickFunnels pricing and whether it is worth the investment. ClickFunnels currently offers two pricing plans: Startup Plan & Etison Suite. The Startup Plan costs $97 per month. With this plan, you receive all the funnel creation tools and you can build all sorts of funnels, sell your products online, add upsells and downsells and even create a membership site. However, you will be limited to creating a maximum of 20 funnels and 100 pages and 20,000 unique monthly visitors. The Startup Plan also doesn't include Actionetics, ClickFunnels' email marketing automation platform and Backpack, their affiliate management system which are only available on the Etison Suite ($297 per month). Most people get started on the Startup plan and they use a third party email service provider like ConvertKit for email marketing automation. The Etison Suite allows you to build unlimited number of funnels and pages and doesn't limit funnel traffic in any way. You also get priority support from ClickFunnels if you're on the Etison Suite. From what I know, there aren’t any coupon codes or promotional discounts for ClickFunnels. But if you decide to pay annually instead of monthly, they do offer a 16% discount which is like getting two months of service for free. If you're interested in purchasing the Etison Suite, you should check out the Funnel Hacks bundle. 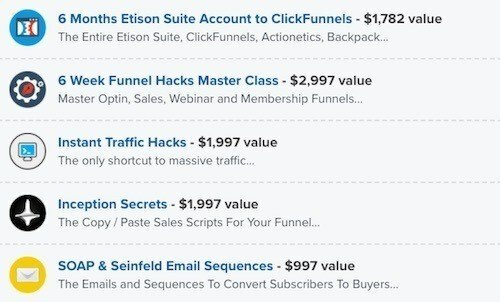 As part of the Funnel Hacks, you get 6 months access to the Etison Suite (worth $1782) and bonuses which include sales funnel training and email sequences for $997. Now ClickFunnels is certainly not the cheapest solution in the market but I do believe that it is reasonably priced. If you were to replace ClickFunnels with a landing page builder and a checkout software like SamCart, you would be paying in excess of $150/month and that won't even include the capability to run a membership site. Plus such a funnel setup would be more complex to create and manage compared to ClickFunnels. 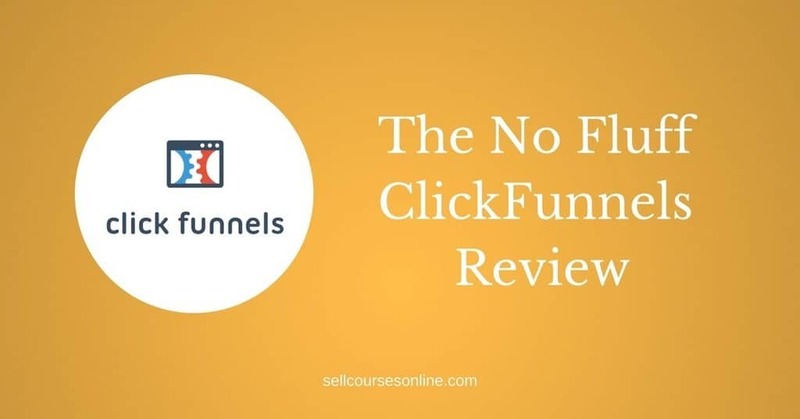 If you'll be using its features, ClickFunnels is worth the price tag and if you want to give it a try, you can click here to get a 14-day free trial. However, If you just need to build a few landing pages to collect leads, you may not be able to justify ClickFunnels' cost and so it might not be the best option for you. One of the best things about ClickFunnels is that it has pre-built blueprints for 26 popular funnel types. There is a blueprint for almost every popular type of sales funnel. It includes: Lead Magnet Funnel, Auto Webinar Funnel, Product Launch Funnel, Storefront Funnel for e-commerce sites. These funnel blueprints make it really easy for you to build complex funnels and are especially handy for those who are new to the world of funnel building. Another thing that I like ClickFunnels is its drag and drop page builder. The page builder is intuitive and easy to use. You can add a row or a column or even a custom element to your page by dragging and dropping and then you can select the element to change its style etc. However the best part about the page builder is the number of custom elements that it has. Some handy custom elements include: survey element, countdown timers, FB comments, SMS signup etc. I use this feature all the time to share funnels with my clients and customers and this is one of my favorite ClickFunnels features. ClickFunnels really takes the game to the next level on its Etison Suite. It includes Actionetics which is an email marketing automation platform and can replace your email service provider. The Etison Suite also includes BackPack which lets you to create and run an affiliate marketing program for your products or services. BackPack is a really powerful affiliate management system and it's worth the investment. Having everything on a single platform is an ideal scenario and while I am not a big fan of all-in-one solutions, ClickFunnels is probably the closest to becoming one at this point. One of the great strengths of ClickFunnels is the large number of third party integrations that it has built. It probably has the most number of third party integrations for a hosted online marketing solution. Payment Gateways - Stripe, Paypal, Clickbank, Infusionsoft, Ontraport, Taxamo etc. 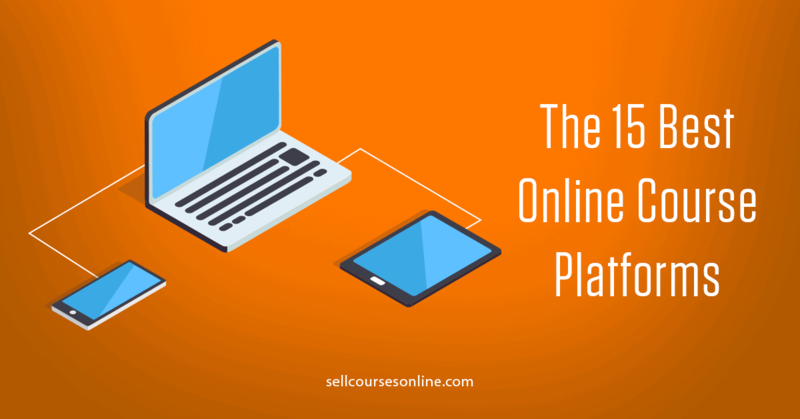 Webinar Platforms - GoToWebinar, Webinar Jam, Zoom etc. Everywhere you'll read stories about how ClickFunnels completely changed someone's lives and how a person was going to get divorced but then they found ClickFunnels and became a millionaire and they live happily ever after. I am not saying that people don't run million dollar businesses using ClickFunnels. In fact I personally know quite a few guys who run seven figure businesses using ClickFunnels. 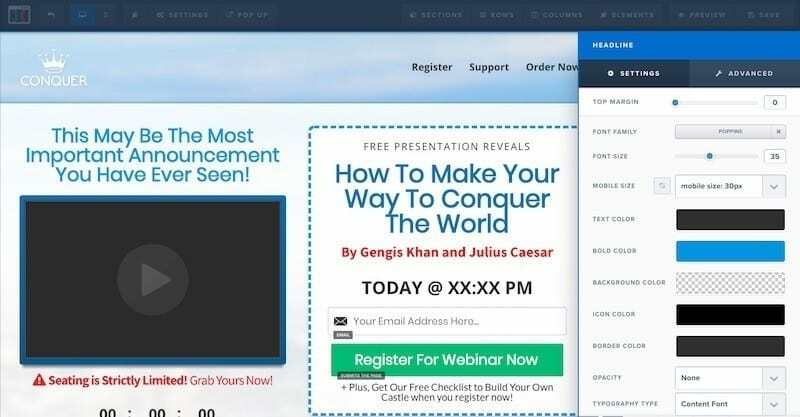 There are 200+ ClickFunnels users who have sold worth more than 1 million dollars using the platform and are now part of the exclusive 2 Comma Club. ClickFunnels is certainly not the easiest platform to start with. You'll need to spend sometime and learn a few things before you can effectively use it. If you were to build a simple lead capture page, you can build it much quicker using a solution like Leadpages as compared to ClickFunnels and that's what I recommend you do. On the Startup plan, ClickFunnels allows you to create upto 20 funnels and 100 pages and upto 20,000 unique visitors. The limit is more than sufficient to help you get started and build your online business and you should be making enough money with 20k unique visitors before requiring to upgrade. However, if you build funnels for multiple businesses or multiple customers, the limit can be restrictive. ClickFunnels does let you build a membership site and even drip your content. However ClickFunnels is suitable only for very basic online courses and membership sites. It doesn't support user progress tracking, user discussions, multiple content types etc. plus the membership area is not very well designed from an user experience perspective. 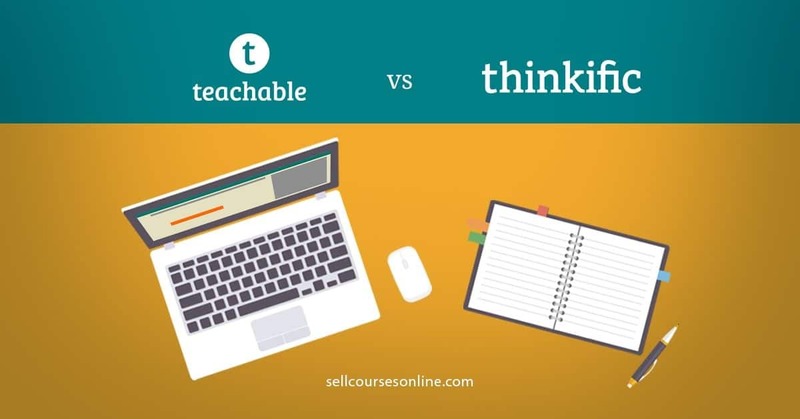 So, if you are selling an online course and want a great user experience for your students, ClickFunnels won't be the best option to deliver your content. 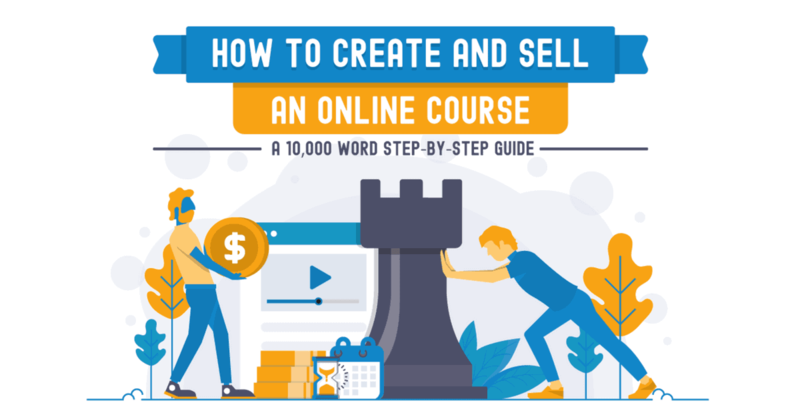 In this case, you can use ClickFunnels to build your funnels and sell your products and then use a platform like Teachable to deliver your content. Let's look at some of the popular solutions that do similar things as ClickFunnels and compete with it. Leadpages is the most popular landing page builder in the market. It has an extensive library of high converting landing page templates which you can customize using their easy to use drag-and-drop page editor. While Leadpages is primarily a landing page builder, they recently introduced the capability to accept payments using their Checkouts feature and they're going to release more features that will let you build funnels and sell your products easily in the future. Leadpages pricing starts from $37/mo but you'll need to be on their Professional Plan ($79/mo) to use features like Inbuilt checkout, A/B testing etc. While Leadpages is relatively cheaper than ClickFunnels, it's much limited in scope and still has some way to go before it can match what ClickFunnels has to offer. Leadpages is the right tool for you if you just want to build landing pages and collect leads. However, if you're looking to sell your products and services as well, you should rather use ClickFunnels. Kajabi is primarily a membership site builder / an online course platform which has added a lot of sales & marketing features to its platform. It lets you build a sales pipeline (sales funnel), send follow up emails, create membership site etc. Kajabi's pricing starts at $129/month, their most popular plan costs $389/month and their Premium plan costs $899/month, making it much more expensive compared to ClickFunnels. 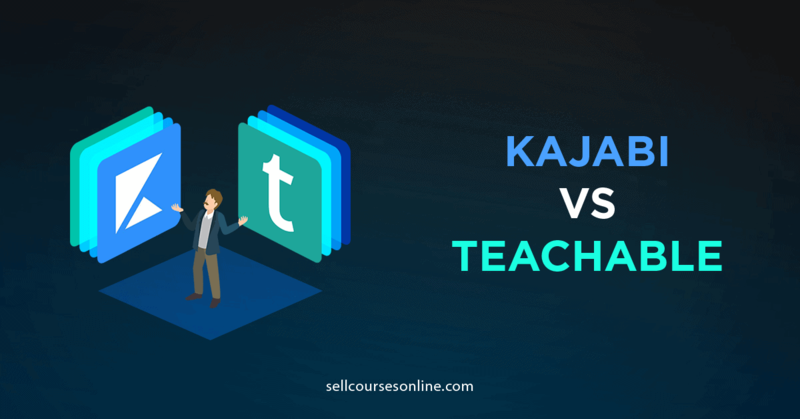 While Kajabi certainly is a better solution for building a membership site, it still is far from being a match to ClickFunnels when it comes to sales & marketing features. In fact a number of guys use ClickFunnels for building their sales funnels and use Kajabi (or Teachable) for delivering their content. SamCart is an online tool that lets you build highly optimized checkout pages to sell your products and services. The important thing to understand is that SamCart doesn't let you build landing pages or sales pages, it just lets you build checkout pages and accept payment. SamCart's pricing starts from $19/month but this doesn't include features like 1-click upsells and A/B testing. Plus it also charges an extra 1% transaction fees. You will be able to use these features and remove the 1% charge on their $99/month plan and you will need to upgrade to $199/month to run an affiliate program. SamCart is a super-expensive software and for a similar price, it offers much less compared to ClickFunnels. It is neither as feature-rich or doesn't integrate with as many payment gateways to justify its pricing. Only situation where I think you can use SamCart is when your pages are already built on another landing page solution like Leadpages and you just want to connect your sales page(s) to an optimized checkout solution. While these are some of the solutions that do similar things and compete with ClickFunnels, none of them match ClickFunnels as far as scope and capabilities are concerned and so isn't a true alternative. There are a couple of solutions (e.g Convertri) which are still in their early stages but have potential to become a true alternative to ClickFunnels in the future. I am constantly tracking these solutions and as these products mature, I will include them in this list. By default, every account gets a ClickFunnels subdomain like https://mybrand.clickfunnels.com. While you can use the ClickFunnels subdomain to launch your school, its not recommended from a branding as well as SEO point of view. On the Startup plan, you can use upto 3 custom domains (e.g. https://mybrand.com) and on the Etison Suite, you can use an unlimited number of domains for your funnels. Also, ClickFunnels lets each user register a custom domain for free, so you can use that for your funnels as well. Can I run A/B tests using ClickFunnels? Yes, ClickFunnels does allow you to run A/B tests for your sales funnels. You can run tests on your landing pages, checkout pages, sales pages etc. You can also choose how much traffic you want to allocate to your page variations. However, ClickFunnels doesn't let you test more than 2 versions of your landing page at the same time. Does ClickFunnels allow to you to do webinars as well? ClickFunnels does allow you to build funnels for your live as well as automated webinars. 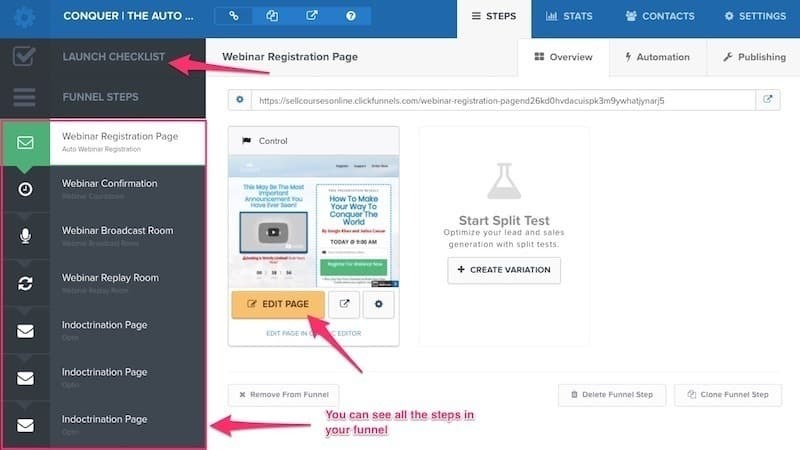 You can even send follow up emails to your webinar registrants using ClickFunnels. However, ClickFunnels doesn't have inbuilt support for broadcasting your live video. You can either use Youtube Live (and embed it on ClickFunnels page) or another webinar platform like GotoWebinar or WebinarJam to broadcast your live event. How is ClickFunnels' customer support? Generally speaking the customer service is good. You can ask a question using the Intercom chat box and you can expect a response from them in a couple of hours. However it can take them a while sometimes to get back which is not great if you need help immediately. They do offer priority support on the Etison Suite where you get much quicker response. However I do believe that ClickFunnels should offer a similar service level on their Startup plan as well. They do have extensive documentation about using the software and you can also post your questions in the Facebook Group to get help from other ClickFunnels users. Does ClickFunnels have an active user community? One of the best parts about ClickFunnels is their user community. The official Facebook group has 135k+ members and its one of the most active communities out there. You can use this group to get answers to your questions, learn from other users, network with them, share success stories etc. Its a great place to hangout and I must tell you that I have learnt more about online marketing by being a part of the ClickFunnels group than any other online community. ClickFunnels is certainly one of the most powerful online marketing tools and there aren't many tools out there that can match it in terms of scope and capabilities. While you can use ClickFunnels to do a lot of things including marketing automation and membership sites, their strength is the core sales funnel builder which I believe is the best in the industry. Ultimately it boils down to whether ClickFunnels is right for you or not and it depends completely on your specific requirements. If you're looking to build just a few landing pages to build your email list, you probably don't need ClickFunnels. However if you are looking to build a sales funnel to sell some product or service, ClickFunnels is certainly a tool that you should consider using. There is no better solution for building your funnels if you're one of those sales-focused entrepreneurs. I hope you found this comprehensive ClickFunnels review helpful. Do you still have any questions about ClickFunnels or got any feedback? Disclaimer: I am using affiliate links within this post, so if you do want to go purchase ClickFunnels, clicking a link will pass me off a little commission (without costing you anything extra)! Want to Give ClickFunnels a Try?